Organist Chad Winterfeldt, a familiar face on the Gustavus campus, assumed his role as the newly-named Cantor of Christ Chapel with the opening convocation on Tuesday in Christ Chapel. To celebrate his new role on campus and to open the 2014-15 recital season, Winterfeldt will present a faculty recital on the Hillgreen-Lane Pipe Organ in Christ Chapel on Sunday, September 14 at 7:30 p.m. The performance will include works by Bruhns, Bach, Hindemith and Vierne. Admission is free and open to the public. For his first recital as the Cantor of Christ Chapel, Chad will open his recital with the Praeludium in e minor by Nicolaus Bruhns and Bach’s Toccata, Adagio and Fugue in C Major, BWV 564. Following a short break, he will return to the organ, continuing with Paul Hindemith’s Sonata No. 1 for Organ and concluding the recital with the Andante and Finale movements from Louis Vierne’s Symphony No. 1. 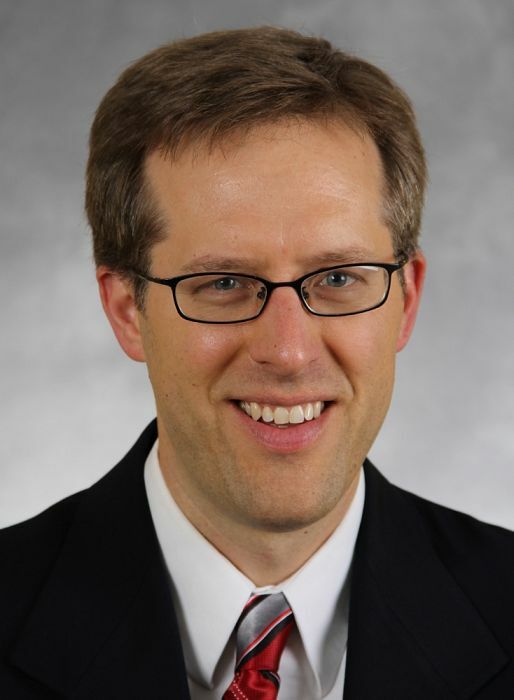 Dr. Chad Winterfeldt, who has served as an organist and adjunct instructor in organ, handbells, and music history for the Music Department at Gustavus since 2004, was named the College’s new Cantor in the summer of 2014. He began his new duties on August 1, 2014. He received a doctorate in organ performance from the University of Nebraska in 2004, where he studied with George Ritchie and Quentin Faulkner. His master’s degree is from Yale University, where he received the Charles Ives Prize and the Julia R. Sherman Prize for excellence in organ playing, and his bachelor’s degree is from Concordia College in Moorhead. Dedicated to both church and academy, Chad enjoys crafting new hymns, arranging music for liturgical ensembles, teaching the art of organ playing, and performing organ music of all periods, but particularly that of Bach and Messiaen. Chad, the long-time Director of Music at First Lutheran Church in St. Peter, is married to Beth, a pianist; together they raise three children: Quentin, Eleanor and Cecily. When he can, Chad likes to backpack, brew beer, bicycle, and read. Chad Winterfeldt’s first recital as Cantor of Christ Chapel begins at 7:30 p.m. on Sunday night, September 14 in Christ Chapel. The performance is free and open to the public. Wish I could be there to hear it! Way to wow us, kid. Er, Dr. Kid.